Gaudete, Gaudete! Iterum dico vobis, Gaudete! Rejoice, Rejoice! Again I say to you, Rejoice! is the translation of the above Latin title for this post. Today is the third Sunday of Advent, otherwise known as Gaudete Sunday. (“You need to Rejoice” Sunday) The church’s ministers don themselves in Rose colored Vestments today as a sign that this penitential season of Advent is almost over. 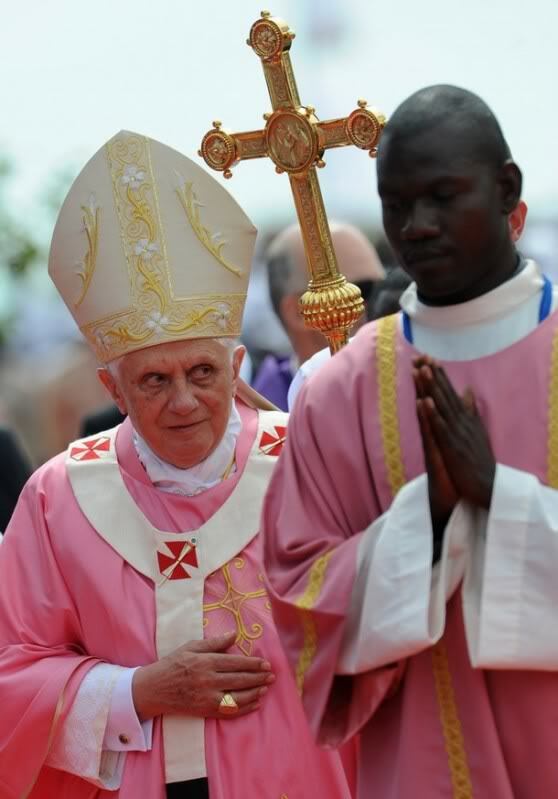 The only other time Rose is worn is on Laetare Sunday during Lent. The purpose behind this color, and it being used so infrequently is to draw our attention to wait a moment! It is almost time! It’s almost here! Am I ready? Did you see Rose vestments today? I did! We rejoice today that our Lord is coming. Veni, Veni Emmanuel! Come Lord and do not delay! Have a blessed “wake-up” call Sunday and remainder of Advent! Gaudete, Gaudete! Iterum dico vobis, Gaudete!!! One of my biggest blessings at the Easter Vigil each year is to chant the Exsultet, proclaiming the triumph of Christ over sin and death, the story of Salvation, and the day of Resurrection! Thanks to Ross for the video! He is Risen! Alleluia! Alleluia! Christos Anesti! Alithos Anesti! He is Risen, Alleluia! He is truly Risen, Alleluia! Alleluia! A beautiful Easter Vigil in the Holy Night this evening! Special thanks to these awesome servers!! The “A-team!” And my family came! Palm Sunday, Holy Thursday, and Good Friday photos. What a wonderful Holy Week this has been thus far! The posts on this site do not represent the Diocese of Owensboro, Bishop Simon Bruté College Seminary, or Saint Meinrad Seminary & School of Theology unless otherwise explicitly stated.